Ready to make the most of your 2019 tournament? 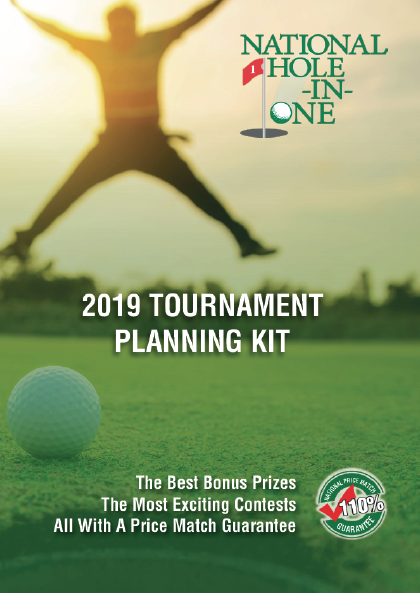 Our 2019 Tournament Planning Kit will get you there! Golf tournaments can be a lot of work and can cost a pretty penny - but they don't have to. From signing on sponsors to help pay for the event to player gifts that wow (and justify a higher entry fee) you can blow last year's tournament out of the water. Download our new 2019 Tournament Kit for a peek at our new bonus prizes, our signage options and the brand new Golfer Appreciation Program which gives every player $150 to spend at our premier partners - TeeOff.com, Oakley and SuperStroke! Oh - And did we mention the coupon to sign on your hole in one sponsor? Download this year's copy of our tournament planning kit and get started making money today!